It’s 11 p.m. on a Saturday night at a UPMC hospital in Pittsburgh when a nurse realizes his patient doesn’t speak English. But this doesn’t delay, derail, or impact the quality of care the patient receives. Thanks to Tami Minnier’s leadership and insight as the Chief Quality Officer for UPMC, the nurse calls an internal toll-free number and is connected to a translator, ensuring the patient’s needs are met as soon as possible. Creating a culture where patients are acknowledged and respected as whole and unique individuals through the CHRIS Initiative is exactly why Tami, Amy Ranier, and their team at UPMC are being honored by the Dignity and Respect Campaign. They Lead the Way, going above and beyond in the implementation of everyday operations. Their best practice in patient care ensures each patient is heard, respected, understood, and cared for as an individual person to the best of everyone’s ability. 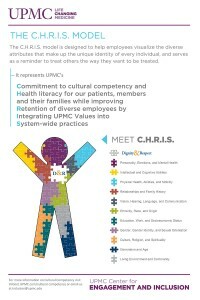 When the CHRIS Initiative was first introduced to UPMC clinicians and employees, a graphic image of a person made up of puzzle pieces represented the program. The CHRIS patient care model allows leadership to help staff understand and put into action the value that not all people are the same – but they are all equally wonderful. Each puzzle piece signified a different attribute of a single patient: religious beliefs, sexual orientation, cultural background, personal goals, and other characteristics and values. “As a caregiver, you need to figure out what is in those puzzle pieces for each of your patients. When you assume you know, and when you think you know, is when you fail. When you don’t meet your patients’ expectations, or you don’t deliver the care that is important to them, or if we don’t communicate to them in a way that they understand, that is when we fail,” Tami said. CHRIS is at the core of UPMC’s patient care programming to the extent that now, each of the variables—or puzzle pieces—of a patient are embedded in electronic records. When a clinician admits a person to a hospital, questions about his or her religious beliefs, sexual orientation and cultural background are asked, so that each employee approaches the patient from the perspective of dignity and respect. The program makes sure every employee views every patient as a whole person with a complex identity and personal history. In addition to embedding the CHRIS philosophy into UPMC’s electronic records system, the initiative can also be seen in action with a hotline that can be used by employees any time, day or night. They simply call UPMC’s CHRIS Hotline for Patient Needs and a question is answered or a problem is solved. As a large organization with multiple locations, UPMC recognized a need to give employees a resource if they experienced a situation they weren’t sure how to handle. “We have woven dignity and respect into the fabric of the organization,” Tami said. These programs aren’t the only aspect of the organization keeping the values of dignity and respect at the forefront of employees’ minds and actions. The success is also measured by holding employees accountable. Fifty percent of an employee’s annual evaluation and potential merit increase stems from whether or not he or she is actually living the values of dignity and respect. UPMC also evaluates potential new employees through the lens of these values, asking specific questions about how they react in various situations. This behavioral approach to the hiring process allows UPMC to make sure new recruits are ready to participate in a culture that values dignity and respect in daily operations—not just with words, but in practice. In addition, UPMC added a Dignity and Respect Index to its employee engagement survey to measure success. Employees are asked about how they perceive the principles of dignity and respect are being implemented in the organization and how authentic they feel in the day to day activity and interactions taking place. From the patients’ perspectives, the program’s success is measured in the number of complaints and grievances. “You realize that it is about how you have to change your culture, and as a result, we have seen the number of egregious complaints really reduced. I am really proud of that,” Tami said. Amy Ranier, senior director of the patient experience at UPMC, is a member of Tami’s team. One of the many initiatives she helps to lead includes the Culture of Service Excellence initiative at UPMC. Leadership looked to direct-reports for support in developing this program, which has been led by employees. The training content—developed for and by employees—has been presented in four-hour sessions to nearly 60,000 individuals thus far throughout UPMCUPMC’s facilities. The Culture of Service Excellence initiative is another demonstration of the commitment that Tami and Amy have to changing the culture for the long-term. Involving employees in every step has been the key to embedding the values of dignity and respect into operations. “Tami and I lead a group called the Patient Experience Leaders. This is an informal group that meets every month. They developed the content of Culture of Service Excellence initiative. I cannot thank enough our training and development teams. They supported the training and this came out of the patient experience,” Amy said. The results prove that leadership has communicated its initiatives effectively, making sure every patient who comes through UPMC’s doors is treated with respect and kindness every step of the way.